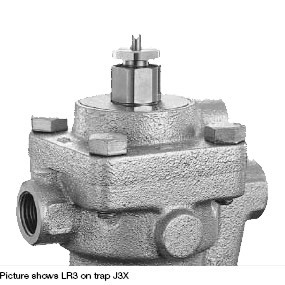 Compact lock release valves for direct installation on steam trap models J3X and J5X - eliminates steam-locking problem simply and easily. - LR3 fits on J3X. - LR5 fits on J5X. - Fine adjustment to keep steam loss low. - Maintenance and repair is possible without removing the valve from the steam trap. By installing on J3X and J5X, cylinder dryers, presses, jacket kettles and other steam-using equipment prone to steam-locking.